Boy, oh boy, have we been busy here at Brix & Columns. Hurricane Florence was scheduled to bring a deluge of water to the Shenandoah Valley, and Jeanette didn’t want to risk letting the grapes stay on the vines. Mom, Gene, and everyone they recruited to help them worked all day for many days to get the grapes picked and properly stored. Just before that busy week, Mom, Dad, and Erin met with Mikey from Mashita to plan the menu for the food and wine pairing dinner. I’ve not had Mikey’s food because “This food is not for you, Winston,“ but he has come to a couple of Friday night music events and his food smells REALLY good. Unfortunately for me, whenever I get close to tasting it, Mom walks right around the corner. It’s like she has a sixth sense, or something. Anyways, during the food meeting I made sure to stay close by just in case anyone needed me to do some menu testing…. No such luck. I did notice something though – when they tasted the wine to determine if it had the proper characteristics to appropriately complement the food flavors, they were swirling it, smelling it, and even slurping it. What in the world! I never take that kind of time with my water. I just enjoy drinking it straight out of the 5-gallon bucket without swirling it or sniffing it any more than is necessary. After a little research, I discovered that there is method to the seeming madness of wine tasting. As long as you remember these 5 “S’s”, you will have more memorable tastings and continue to expand your understanding of wine characteristics and your personal tastes. See – Color is your first clue into a wine’s integrity. The hue can guide you to determining the varietal used to produce it as well as the level of saturation. This is best achieved by looking straight down into the glass. Next, view the wine from the side to measure clarity. Good wines should be sparkly and brilliant; if they are less than clear, it is a sign of either unfiltered or shaken up wine or a wine with some sort of issue with its chemical composition. Finally, tilt the glass to examine the color near the edges of the wine. It shouldn’t appear pale or discolored. Thinned out color suggests a wine with less oomf and discoloration indicates that the wine is past its prime. Swirl – Swirling the wine in the glass, by keeping the bottom of the glass on the bar or table, allows you to see the legs of the wine as they roll down the sides. Thick legs are evidence that the wine is full of flavor and high in alcohol content. Smell – Sniffing the wine is best accomplished by holding your nose slightly over the glass, after giving it a good swirl, and taking a series of short smells instead of one large one. Allow your brain to process after. Not only can this alert you to any flaws in the wine, but a thoughtful sniff can also clue you into the fruit flavors, herbaceous characteristics, and even hints of the terroir in which the grape was grown. 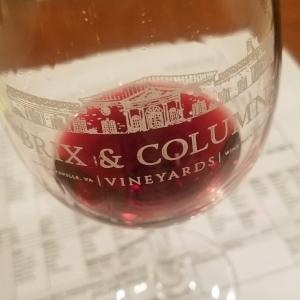 Smelling the wine is also a great way to determine the barreling process used on the wine, and it can also give clues about the fermentation process used. A great example of this is the buttery smell that Chardonnay takes on when taken through malolactic fermentation. Sip – At last the moment has come that you have been waiting for: it is time to taste the wine. Take a small sip into your mouth, tilt your head slightly forward, and breathe air in through pursed lips to bring the air through the wine. This allows you to fully taste the wine by incorporating both its smells and flavors. Savor – Now it’s time to savor. Use the previous techniques to choose wines that are harmonious, well-balanced, appropriately complex, and, most importantly, pleasing to YOUR palate. At this point, I would propose we add a 6th S.
Sitting – We have a lovely patio for you to sit on while you enjoy all of our wines, and if you stay long enough I am sure I will be down to greet you and do my own sniff test on any goodies you might have brought! Field Trip Day!!! Harvest Time!